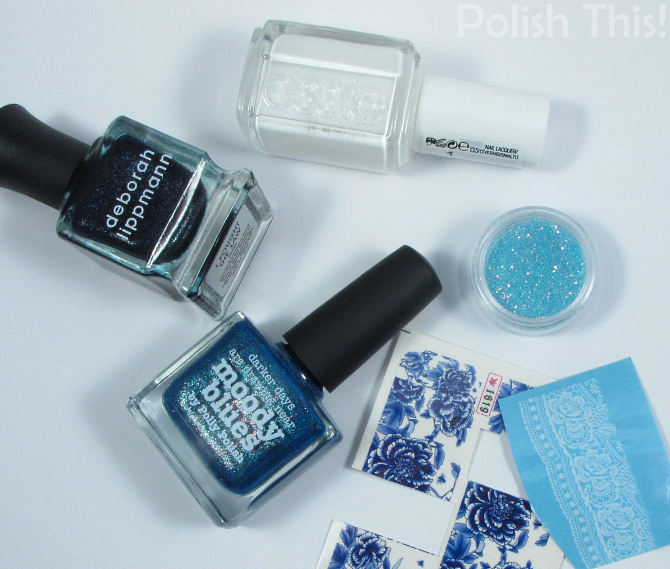 Picture Polish Moody Blues Skittlette - Polish This! You know, the other day I was going through my untried polishes thinking that I really wanted to try them all. I have quite a few of those currently (shame on me), so I didn't really do that, but I thought it was a good time to do another skittlette and at least try couple of those untried ones. I also managed to add couple different water decals that I've had quite a while to this manicure. That's really the perfect receipe for skittlette, just add everything you want to try... Or not, but at least I really liked this manicure! 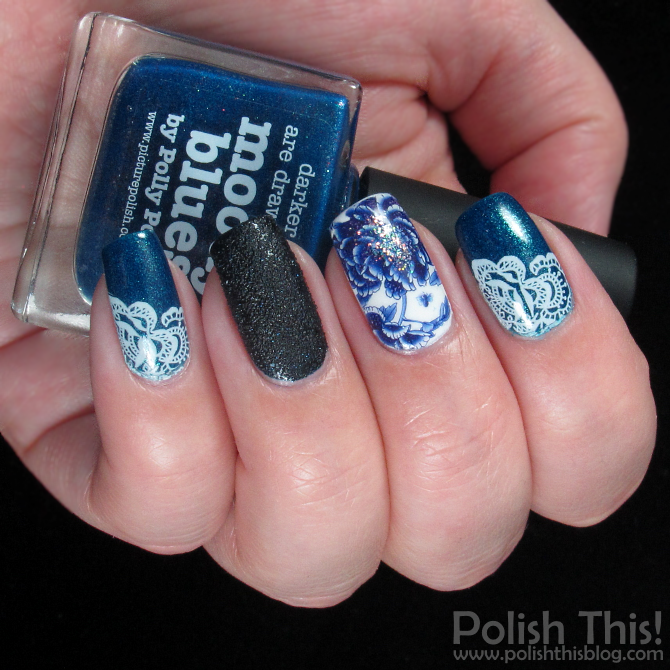 Of course the star of this mani is Picture Polish Moody Blues and what a gorgeous polish it is! This is a tad older collaboration shade (I think 2013) and I haven't seen this one out there so much eventhough Picture Polish lacquers seem to be pretty much everywhere right now... So if you, like me, have overlooked this Moody Blues, I highly recommend to take another look! It's truly beautiful and at least every blue lover should own this one. I used PP Moody Blues on my index and pinky nails, though I kinda wish I had used it on all my nails now... Anyhow, I also wanted to remove Deborah Lippmann I Fought the Law from my untrieds, so I used that one on my ring and thumb nails and for my middle nail I first painted two coats of Essie Blanc and then applied that full nail water decal. It has some see-through parts in it, so I thought it would work best over a clean white polish. 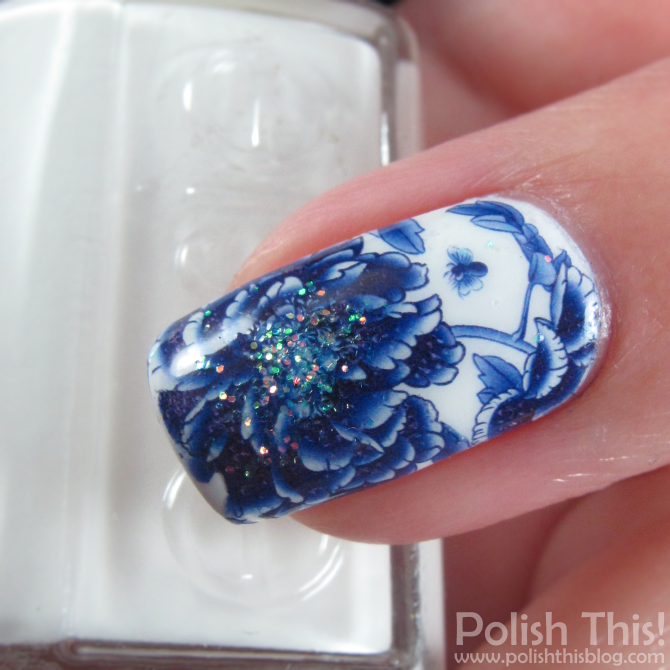 Finally I also added some loose glitter in the middle of the flower and some lace water decals over Moody Blues nails. Yup, isn't it pretty?!? I say it's gorgeous and quite unique too eventhough I have quite a few blue ones already... I used 2 coats of Moody Blues here. 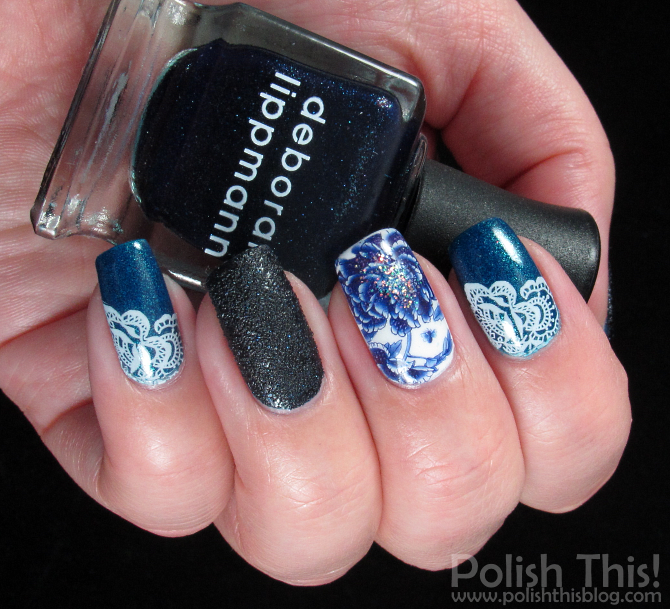 Deborah Lippmann I Fought the Law looks more blue in the bottle, but it looks pretty much black on nail. I wish it would look more blue on nail too, but then again, as a black it works better as an accent nail with many different color combos. Those tiny blue shimmers flecks in it are really pretty! I used also two coats of I Fought the Law. Did you notice that little bug in the water decal?! That's quite funny, though maybe I would prefer my flowers without any bugs... I think I've bought these decals from Born Pretty Store quite some time ago, but I'm not totally sure. In any case, these were really easy to use and they went just where I wanted them and so I didn't have any problems with these. Do you guys have many Picture Polish lacquers already? Which PP is your favorite? Tosi kauniit kynnet! <3 Tuo Moody Blue on upea lakka!